This combination you will find in most tree nurseries, for good reasons: - Compact size and good manoeuverability permit work in narrow planting rows. - Tree and tree spade are in full view of the driver. - Within minutes the tree spade can be exchanged for another implement. Both lift arms are removed and replaced by a lift mast. 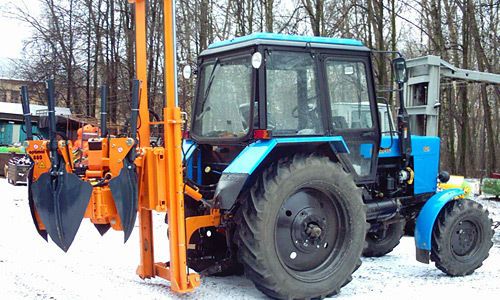 With this alteration the loader loses its versatility, but it increases the lift capacity and improves manoeuverability. 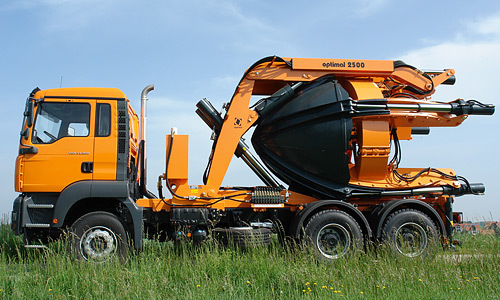 This highly efficient unit has been designed for large and modern tree nurseries. 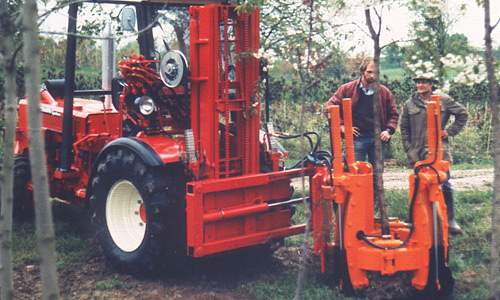 The lift mast with the bolted-on tree spade is attached to the hitch points of the tractor. The upper link is a hydraulic cylinder which can tilt the lift mast and align the tree vertically. This lift mast is used for selective harvesting in narrow tree rows. 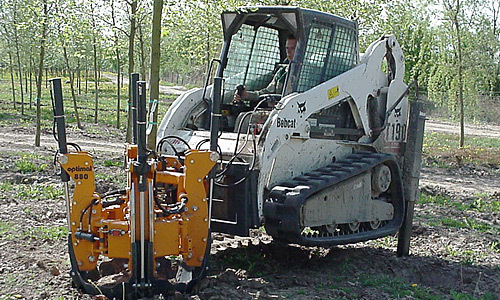 For digging, the tractor is positioned parallel to the tree. The tree spade swings around for 90°, opens the gate and slides towards the tree. 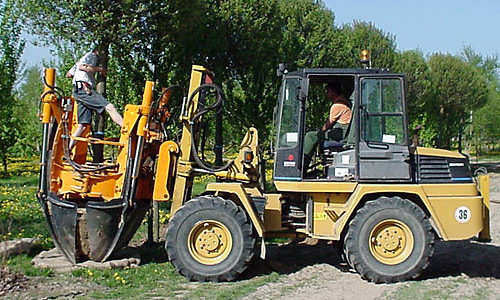 While the tree is positioned in the center of the spades, the tractor does not move at all. Rear stabilizers keep the machine steady when digging. For work outside nurseries and when transport on public roads is involved, truck-mounted tree transplanters are used. They can swing the digging head and the tree – with the root ball forward - into a horizontal position. This way the tree is safely transported with little wind resistance and an unobstructed driver's view.